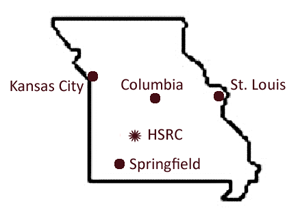 The Hermitage Spiritual Retreat Center is located on Lake Pomme de Terre in south-central Missouri near Pittsburg -- which is one hour north of Springfield, one-half hour north of Bolivar, 2 1/2 hours south-east of Kansas City; 2 hours south from Jefferson City; 2 1/2 hours south from Columbia; and 3 1/2 hours southwest from St. Louis. We have provided driving directions for your benefit. Retreatants have reported that Google Maps and an app called Waze give good directions also. From KANSAS CITY take route 49/71south to the Harrisonville exit marked Route 7 to Clinton. At Clinton continue onto route 13 south for 34 miles to route 54 (at the Collins/Pomme de Terre Lake exit). Take route 54 left (east) to the town of Hermitage, and there take a right (south) onto route 254. When 54 turns right, continue on 64 (which at the Nemo intersection turns right), across the lake bridge. 1.6 miles after crossing the lake turn left onto the gravel road marked county road 306 (Mel Jenkins Building Materials is on that corner). Then follow the detailed directions below. From JEFFERSON CITY take route 54 southwest to Preston. Continue on 54 less than a mile beyond the intersection with route 65, then turn left (south) on route D to the intersection with route 64 (at Nemo). Go straight through the intersection onto route 64; 1.6 miles after crossing the lake turn left onto the gravel road marked county road 306 (Mel Jenkins Building Materials is on that corner). Then follow detailed directions below. From SPRINGFIELD take route 13 north to route 83 going into Bolivar; at the Bolivar square go right (east) on route 32 a short distance to route D; go left (north) and where it meets route 64 continue straight on through Pittsburg [.1 mile past the Post Office] to the gravel road marked county road 306 on the right (Mel Jenkins Building Materials is on that corner). Then follow the detailed directions below. From ST. LOUIS take I-44 southwest to second Lebanon exit (#129) and go through Lebanon toward route 64; continue on 64 through Pittsburg. .1 mile past the Post Office north of Pittsburg turn right onto a gravel road marked county road 306. Mel Jenkins Building Materials is on that corner. Then follow the detailed directions below. DETAILED DIRECTIONS. Once going east on the gravel road marked county road 306, go past the Missionary Baptist Church on the right, for .6 miles. When you reach county road 311 turn left. 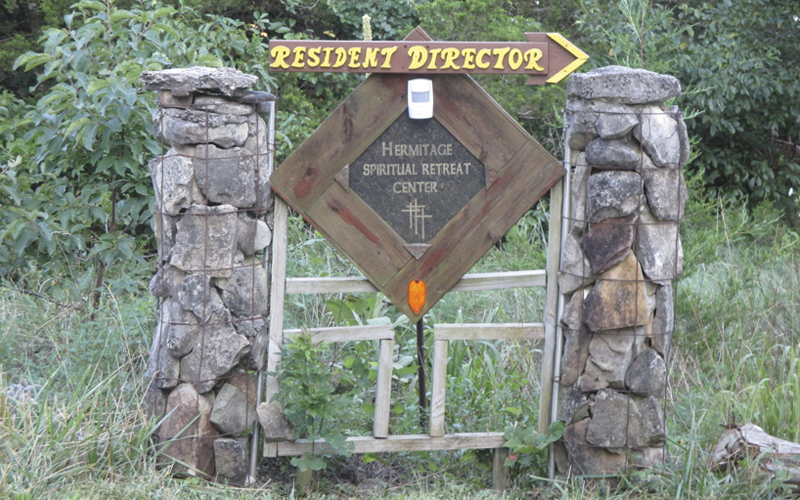 Continue .6 miles, past a wonderful 150-year-old log cabin until you see on the right the entrance towers and gate with a large sign marked "Hermitage Spiritual Retreat Center." 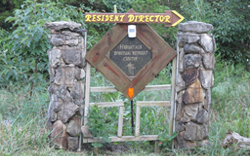 Take a right through the gateway and turn right toward the bottom of the hill where the sign indicates the Resident Director may be found.